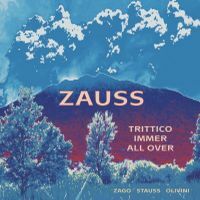 The working relationship between Francesco Zago and Markus Staussm known in this project as Zauss, has been going on for several years now and in 2017 we saw the release of their latest effor Trittico Immer All Over. While the duo had released 4 previous records from 2006 onwards, this album marks a slight change. With the addition of drummer Giuseppe Olivini, the direction of Zauss was becoming more and more intriguing. Previous efforts focused a lot on creating an atmosphere and on minimalism, so fans of Zauss were hopeful that the new addition would add another dimension to the already rich palette the duo had to offer. As the CD starts playing, you are met with the familiar ambient exploration, jazz minimalism and improvisation, where the space between the notes sets an eerie atmosphere, much like we've grown accustomed to with Zauss. Giuseppe certainly adds a variety of percussive persuasion, enriching the sound further, however it is not a drum assault like you might find in rock music. His contribution is very subtly and gently added on top of Stauss's saxophones and flutes and Zago's guitar. Zago's work is exceptional again, ranging from wild distortion attacks to quiet dreamy segments, always exploring the sonic capabilities of his instrument. Markus Stauss provides the most lead work and his sax and flute work provides both jazzy boldness and ambient sensibilites. Not exactly a work to be enjoyed by fans of in-your-face, standard rock and pop tunes, this album will rather appeal to people who enjoy the more experimental and avant-garde side of jazz, with an emphasis on building a very strong atmosphere. The usual Zauss quality with a bit extra on top!